Morocco is truly the hidden gem of World Showcase, and even for those who know the pavilion, there are always surprises to be found along its winding paths and in tucked away corners. Let’s take a look at Tangierine Cafe as an example. Most guests are aware of the vegetarian and shaved meat dishes, or are at least familiar with the wafting scent of the roasting meats as they pass by, but do you know about the bakery? Tucked away in a corner of the restaurant, stands a small stand serving specialty coffees and a bakery case filled with Moroccan desserts. The most prominent of these desserts are the baklava. Baklava is a type of pastry that combines layers of filo dough along with honey and nuts. There is room, as I am sure you can imagine, for all sorts of variations of baklava, from how the dough is layered to the types of nuts used within the pastry. Tangierine Cafe serves up three types of baklava, but today we’re going to occupy ourselves with the traditional form of the dish which utilizes walnuts. Now, I could let this pictures stand for itself without another word, couldn’t I? The thin layers of dough almost number too many to count, but contribute a brittle, yet dense texture to the baklava. As is common with baklava, you will notice there is more than one layer of minced walnuts, which adds a sweet, earthy flavor to the pastry. Additionally, the walnuts also add some variety to the texture of the baklava. Last, but certainly not least, the syrupy goodness that is the honey that has permeated every layer of this flaky taste of Morocco. 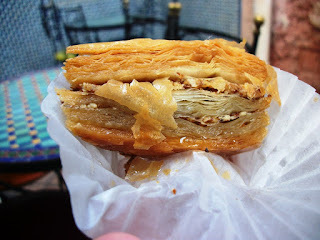 We’ll look at the other varieties of Tangierine Cafe’s baklava another time, but this delicious pastry is a perfect bite to personify and take away from the Morocco pavilion. A simple design that is sure to delight, but yet hiding truly wonderful secrets within its nooks!